It couldn’t be true, he thought as he hung off the rock face. If it was, if he really was protected like that, then there would have to be other times, other incidents when he’d walked away from something that could have killed him. And then he remembered. He remembered his tenth ever parachute jump, still in training, passing the two thousand foot mark with his main ‘chute and his reserve both having failed to open, with the sunlit hills and lakes of Southern California stretched out in front of him for what he genuinely believed was the final time. He remembered rolling onto his back to see the sky one last time, only for the change in airflow to free the release mechanism, pulling the parachute out through the side of the pack in a way it should never have been able to go. He remembered a wreck dive, three years before, swimming through a ragged gap in a sunken freighter’s hull, only for a curtain of torn netting to tangle his fins and hoses, binding him tighter the more he struggled as the current began to push him onto the knife-like ribs of the vessel’s corroded frame. He remembered trying to flail and tear at the nets, trying to reach for the knife strapped to his leg, only to find himself suddenly free, outside the knot of rope and seaweed with no sign at all of how it had released him. He remembered a climb in Oregon, falling from a vertical cliff far higher than this one, knowing with absolute certainty that when he felt and heard the four anchor points pull loose there were no others to hold the rope in place, then owing his life to that small spur of rock that caught the line and slowed it to a standstill, leaving nothing but two hundred feet of fresh air beneath him. He was hanging by two fingers of each hand now, his feet wedged up against whatever support they could find as he tried to hold his weight. Another metre was all the progress he needed before he’d be back on the vertical. He reached out to make the move, and that was when the thought hit him. If it really is true, and it really is the same for everyone, and we all get to live forever, is there a reality out there where mom never died? Where she’s still alive now? It was as if the strength had been drained from his body. One moment he was gripping onto the cliff, the next he was falling. He heard Grace calling out somewhere beneath him as the line went taught, but apart from that the only sounds were the rope humming through the anchor point, and the blood rushing inside his head. Veejay Seo has a death wish. When every high-risk high-adrenaline sport has left him unscathed he turns to spacediving: exo-atmospheric skydiving, competition jumping from partway up the world’s first space elevator. So when he survives yet another near-fatal accident, escaping with his life in ways no one can explain, he finds out the real reason for his inability to die – a quirk of reality where the laws of physics conspire to see him survive, time after time. And what is more, he is not alone. But to Veejay the gift of immortality is a curse. Raging against his inability to achieve the only thing he ever really wanted, he tries his most dangerous stunt yet: a space jump so hazardous that no one has even attempted it. And his reward for pushing back against the forces keeping him alive: a glimpse of what really lies on the other side, the true nature of reality, and the world-shaping destiny that lies with him. This is another of the stories that I put forward for Writers of the Future (starting with Mind Games which got to the finals, then Contact Authority which went on to win, with this one getting an Honourable Mention in the middle). 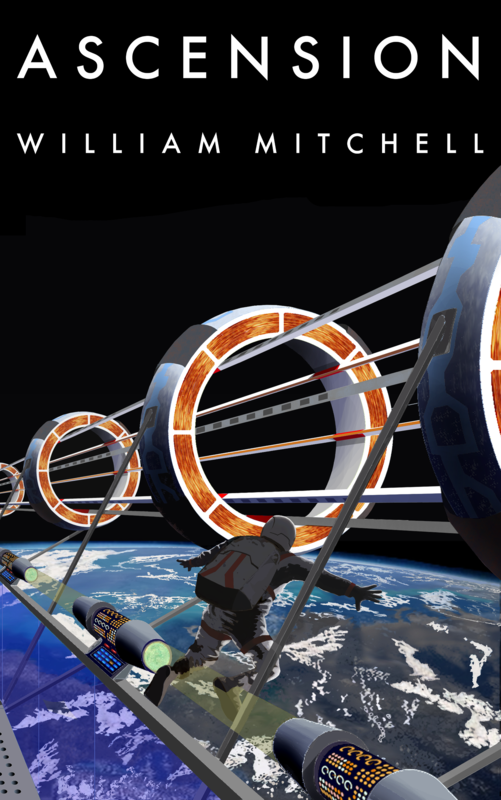 As with those other stories the length made publication in typical SF markets difficult, with only a handful of potential destinations, so when I took my first leap into self publishing these were the stories I put up. Ascension is available here.